Our Story Who is Steve Chou? Today I have my friend Rachel Miller on the show. Several months ago, Rachel spoke at my conference, The Sellers Summit, and she knocked it out of the park. Rachel runs a popular training class called Moolah where she teaches others how to build humongous Facebook followings with rabid fans. She’s created multiple Facebook fan pages with more than a million likes and she uses these pages to drive traffic and sales to both physical and digital products. In this episode, she’ll teach you how to drive traffic organically to your website or Amazon without spending a lot of money. How she uses Facebook to market her sites. How to use your fan page to drive organic sales for your physical products. Klaviyo.com – Klaviyo is the email marketing platform that I personally use for my ecommerce store. Created specifically for ecommerce, it is the best email marketing provider that I’ve used to date. Click here and try Klaviyo for FREE. Scope.Sellerlabs.com – If you are selling on Amazon, then Scope from Seller Labs is a must have tool to discover which keywords will make you the most money. Click here and get $50 off the tool. SellersSummit.com – The ultimate ecommerce learning conference! Unlike other events that focus on inspirational stories and high level BS, the Sellers Summit is a curriculum based conference where you will leave with practical and actionable strategies specifically for an ecommerce business. Click here and get your ticket now before it sells out. Steve: You are listening to the My Wife Quit her Job Podcast, the place where I bring on successful bootstrapped business owners and delve deeply into what strategies are working and what strategies are not with their businesses. 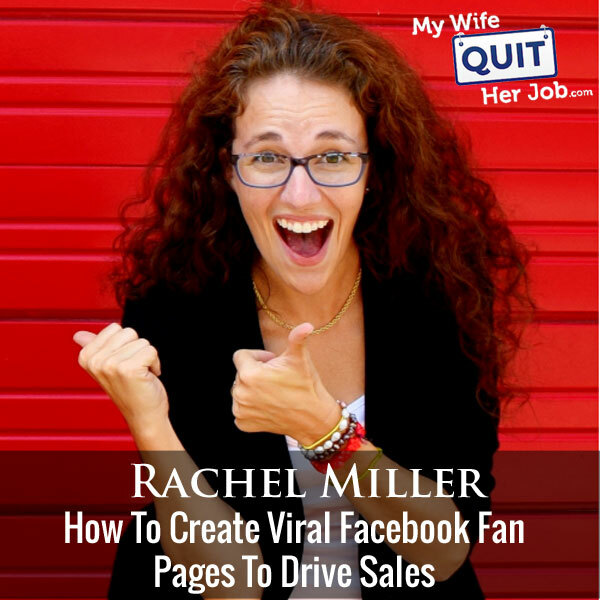 Now today I’m thrilled to have Rachel Miller on the show, and today we are going to talk about how to create crazy popular Facbook fan pages without spending a lot of money. But before we begin I want to give a quick shout out to Klaviyo who is a sponsor of the show. Now I’m always excited to talk about Klaviyo because they are the email marketing platform that I personally use for my ecommerce store, and I depend on them for over 20% of my revenues. Now you’re probably wondering why Klaviyo and not another email provider. Well Klaviyo is the only email platform out there that is specifically built for ecommerce stores and here is why it’s so powerful. Klaviyo can track every single customer who has shopped in your store and exactly what they purchased which allows you to do many things. So let’s say I want to send an email out to everyone who purchased a red handkerchief in the last week, easy. Let’s say I want to set up a special auto-responder sequence to my customers depending on exactly what they purchased, that’s a piece of cake, and there is full revenue tracking on every single email. Now Klaviyo is the most powerful email platform that I have ever used and you can try them for free at mywifequitherjob.com/K-L-A-V-I-Y-O. Once again that’s Klaviyo, mywifequitherjob.com/K-L-A-V-I-Y-O. Now I also wanted to give a shout out to my other sponsor, Seller Labs and specifically I want to talk about their awesome Amazon tool, Scope. Now if you know me I get really excited about tools that I use and like, and Scope is actually a tool that increased my Amazon sales on several listings by 39% within the first week of use, crazy, right? Now what does this tool do that could possibly boost my sales so quickly? Well, quite simply Scope tells you what keywords are driving sales on Amazon. So here is what I did, I searched Amazon and found the bestselling product listings in my niche and then I used Scope to tell me exactly what keywords that bestselling listing was using to generate sales. I then added these keywords to my Amazon listings and my sales picked up immediately. So today I use Scope for all my Amazon products to find high converting keywords in the back end as well as for my Amazon advertising campaigns. So in short Scope can boost your Amazon sales almost immediately like they did for mine, and 39% is nothing to sneeze at. Now right now if you go to Sellerlabs.com/wife you can check out Scope for free, and if you decide to sign up you’ll get $50 off of any plan. One again that’s Sellerlabs.com/wife. Now on to the show. Intro: Welcome to the My Wife Quit Her Job Podcast. We will teach you how to create a business that suits your lifestyle, so you can spend more time with your family and focus on doing the things that you love. Here is your host, Steve Chou. Steve: Welcome to the My Wife Quit Her Job Podcast. Today I have my friend Rachel Miller on the show. Now several months ago Rachel spoke at my conference, the Sellers Summit and she knocked it out of the part. There is like this huge crowd around her asking questions, and Rachel and has an amazing wealth of knowledge when it comes to building humongous Facebook followings with rabid fans. And she’s built multiple Facebook pages with more than a million likes, and she uses these pages to drive traffic and sales to both physical and digital products. Anyway one of the most common questions that I always get asked is how to drive traffic organically to your website or your Amazon listings without spending a lot of money. And today Rachel is going to teach us exactly how she does it. And with that welcome to the show Rachel, how are you doing today? Rachel: Steve, thank you so much. It’s great to chat with you again. I had so much fun with you at Sellers Summit. Steve: Yeah, totally. So just for the listeners out there, Rachel has like so much energy and it’s awesome and it’s really infectious. So I know you guys are going to enjoy this episode. Rachel: I might be a little energetic yeah, it’s been so much fun seeing people’s business grow and helping — I used to be one of those people hoarders who just horded people for my self and I’d collect these audiences and be like, I don’t want to tell you what my product is, I don’t want — now I’ve actually shown other people how to make almost the same audiences I have and it’s really fun to see, it just explodes. It’s not like mine stops growing. It’s just, it just multiplies, it’s so much fun. Steve: And I’m actually a member of Rachel’s class and the stuff that she teaches really works. And that’s kind of what we are going to be talking about today. But before we start, Rachel, like what is your story? Like I know you started some ridiculously popular blogs in the past, but how did you kind of transition over to Facebook pages? Rachel: Well, I started — my first blog was Quirky Momma. I started that one and then worked on it until it was 2.2 million and then left that business, and the cool thing is that after I left it was almost like a transition period for me. So I started a new one but I used a lot of the resources I had in the past. I used my other audiences, I used Quirky Momma to help build. So I got shares from big pages, I got shares from big friends, I had shares from like I would pay a couple of big bloggers money here and there to help share my content. So I was using all of these resource that people had, that other people didn’t have to build this new page in record time, and I think I built it to like 500,000 in like less than a year. I think it was like 18 months I got to 500,000. But the thing is that it wasn’t replicatable if you didn’t have a large budget and if you didn’t have a lot of relationships that you could on. Steve: But you build that first Quirky Momma site up to 2.2 million you said, right? Steve: That was from scratch, right? Rachel: The first million was zero advertisement on that. Rachel: It was all organic on that one. I did help in the sense we created relationships with other blogs and so we would all share each other’s stuff. Steve: Okay, okay. But with Quirky Momma though, did you drive — was most of your traffic derived from Facebook for that first blog? Rachel: Facebook and Pinterest, yes. Steve: Facebook and Pinterest, okay, okay. Rachel: Yes and then I roughly, with One Crazy House I got over nine million page views in 2016 from Facebook. Steve: Just from your fan page, like without ads. Rachel: Just from Facebook, yes. Steve: That is crazy. Okay. Steve: So with this blog then, so do you focus more on like the blog content these days or do you focus on like the Facebook page stuff? Rachel: I focus on building audiences and right now my audiences are primarily Facebook and Pinterest. Facebook is the one that I’m exploding on right now, but I mean these principles can be used really on any social media platform. Rachel: So Facebook is the one that I’m focusing on but yeah, but I get my traffic and have grown my websites by building an audience. And then when you build that audience you can ask them what do you want and what makes your heart happy, and then give it to them and they become your die hard funs. Steve: So would you say then that it’s almost not even necessary to have your blog? Like if you have this huge Facebook page, like doesn’t that kind of replace the blog? Rachel: It does, it’s kind of crazy. But it does have a life of its own. You don’t actually need a website as much anymore. You can have a landing page with your products that you are selling and a Facebook page that has your audience like you are engaging with and use those seamlessly to promote each other. Steve: And so how do you — I’m just curious how do you use these Facebook pages to make money right now? Rachel: Lots of different ways. We’ve got — I do have seven, I guess eight now private label products. Steve: Oh, you do? Okay. Rachel: Yeah, I do have private label products that I sell. I do sell a couple of retail arbitrage products, and then I’ve also got where I sell affiliates of everybody else’s products. So I sell affiliates to find out what people are buying, and then I see if that thing that people are buying can I source that. And if I can affordably and easily with very minimal time effort on my part then I’ll go do that and if it’s going to take time, effort, research then I’ll outsource that task or not source it myself and just do an affiliate on it. Steve: Interesting. So in terms of the products that you sell, are they — they had to be obviously related to your Facebook fan page, right? Rachel: Yes, you have to find a way to connect that to your readers and to your reader’s hearts. So chalkboard labels, this is going to make your life easier getting ready for school because you are going to have all your products, your things that you need organized and if you need to change your label you just wipe it off and you can rewrite it. So chalkboard labels, they are very easy, quick to source from China, they are very cheap and I can have a high mark up on them. So that was one of my products that I sell. Steve: So to develop that product, was that like a school based fan page? Rachel: No, that one was to anybody who would want to write something on a label. So I would make an ad for it and I would put that ad on a DYI home site. I would do it on a preschool site; I would do it on even my cat site because you could label your cat food and label your cat products. Steve: I see, I see. So you don’t really have to — so you build the fan page first and then you find products that kind of fit into the mold? Rachel: Yes. So things like, I know my DYI home site loves to buy mats. There are certain types of mats that I sell the most of even when I promote other people mats. Like that’s the one that they all tend to go back towards. And so if I could, I actually can’t source because it like the brand will only work with this other seller wherever they’re like they are locked in the contracts, but whenever I link to that product I can sell more. I know I can put that product up on Facebook and I can sell. Steve: So can you give me an idea of like how much product like as an affiliate first. Like what’s you process? Like how do you figure out whether it’s a home run or not? So you’ll post something about a product, what does the posting look like, and what are some good numbers for it? Rachel: My best bet in my mind is to have something that’s entertaining. So something that makes someone smile, something that makes their day better. So a lot of my products that I sell I sell through memes or through photos of the products in use in someone’s life. One of my students just like two weeks, three weeks ago maybe sold a weaner dog paper towel holder. Rachel: I know, she sold out of it on Amazon and she’s just talked on her page about how it was kind of ridiculous that she had to sign her counter and she linked to the product on Amazon and sold out of that product. Steve: So what is selling out? We are talking of thousands of units, hundreds of units? Rachel: I don’t know how many units she sold of it, but Amazon went ran of stock. Steve: Okay, okay and so was she an affiliate or was that her own product? Rachel: She was an affiliate and she made over $2,000 on the affiliate sales of that product. Steve: Wow! Okay and so typical affiliate pay is like 5%? Something like that. Rachel: It ranges between four and eight depending on the product. Steve: Four and eight, okay. Rachel: So if it’s a household product, sometimes it’s up to eight. Steve: So you would consider that a success obviously. Steve: So from that point would you try to start sourcing it? Rachel: Yes, if I was that person I would try to seek where I could find that product and then source it, and then I would control the traffic that goes to that product. So next time I put that link up it would always be my product that’s up there. Steve: Okay and so you can put these links up over and over again on your fan page? Rachel: And once you have a winner, I tend to cycle them where they go up two to twice a month every other month. So it depends on how often. Rachel: Like a Christmas product I might have go every other month during the whole year but then during Christmas time it will go up every other week. Steve: I see and then so when you have your own product you get to keep all the product profit. Do you also get affiliate revenue off of that also? Rachel: Yes, if you have it set up where it’s a separate EIN for your affiliate and a separate EIN for your business that is selling the product. Amazon at least whenever I talk to them lets me have multiple accounts as long as they are all under different tax IDs. Steve: Okay, this is really interesting. And so just for the benefit of the listeners here, what have been some of like your viral posts that have generated a ton of traffic for your stuff? Like what’s your best that you’ve ever done? Rachel: My best personal one, well toilet paper is my ongoing one. I can sell toilet paper through Amazon Prime now that now delivery with a post about — one post is about kids playing with toilet paper, and the other one is about your cat shredding toilet paper, and basically saying you are out of toilet paper, lucky for me Amazon delivers in an hour. And then you can tweak lucky for me I get another shipment coming in next week because it’s subscribe and save. So I push those products and that’s my ongoing one that sells the most, but my all-time best is these cat rolling pins. And I sold, I think I made like $2,000 off two $3,000 that month off of cat rolling pins, but I continue to make revenue off of that for like three or four months just on affiliate link and it took me three or four minutes to put it up. Steve: That’s crazy. So what — sorry I don’t know, what’s a cat rolling pin? Rachel: It’s a rolling pin like to make cookies. Like you know you roll out your rolling pin you know, only it’s got like embossed cats on it. So whenever you roll the cookies or whatever it is that you are rolling on has the shape of cats. Rachel: And so that — my Crazy Cat Lady page went crazy about it, but here is the thing, my other pages also ended up going crazy with it too. So it didn’t just do well in Crazy Cat Lady, it did well in my Crazy House one and that one I said, know someone who is a crazy cat lady? So I framed it in such a way that everyone would share with their crazy cat lady friends. Steve: I’m just trying to picture, in order to make a couple of thousand dollars worth of affiliate sales, that means you have — like how much traffic do you have to drive to make that off of a post. Rachel: Well, I sold out of Amazon products, so I probably could have sold more but I brought in four million eyeballs to that. Steve: That is crazy, okay. Rachel: So but it sold out. So if I had known that it was going to do well I could have had multiple providers of that product or you know. Steve: Is that one your own is that one affiliate also? Rachel: That was an affiliate one. Rachel: So that was my best one that was an affiliate, yeah. Steve: Are you planning on selling these cat rolling pins then? Rachel: I was until I found out that there is like, like you have to make sure that they are like end up the paint on it is you have to have the paint test it and all of that other stuff. So it’s easier for me to not have to — that’s a lot of work to figure out what all those parts are so I don’t get sued. So I just have somebody else, it’s like I’m going to do the chocolate labels, easy. Steve: Right, yeah, yeah, okay. That makes sense. Rachel: I go the path of least resistance. So if it can take me 15 minutes to make money on it, it takes 50 minutes for me to source to chalk board labels. It’s going got take a lot longer to source that one in a way that I won’t get in trouble with. Steve: No, that totally makes sense. So when it comes time to do this, do you — so you put up the fan page first and then you figure out what products make it in there as opposed to figuring out what to sell out first and then creating the fan page, is that it? Rachel: Yeah, I create the audience because when you have – it’s like the cart with the horse you kind of need both. You need the cart which is your product that you are selling and you need the horse to drive that cart somewhere, the traffic, right? Rachel: So you need both. So I like to get the horse first and the find out what kind of cart fits that horse. Rachel: What kind of products can that horse drag? Steve: So let’s talk about, so now that we’ve kind of talked about the power of these pages that you are building, let’s talk about how you create one of these fan pages. Like how do I get started from scratch? Rachel: Oh it’s fun, I like to do, I have what’s called the fast track plan and that’s where you can post win, but before you even start — and that plan is free and Steve can give you like a link to it. Steve: Okay, yeah we’ll post it, just send it to me after this yeah. Rachel: Cool. So you guys can follow exactly what I schedule in, but before I begin the fast track plan I like to do tests because you need to find out who your readers are, what they are going to relate to, and then where they are. So who your readers are, okay I want to do a niche about cats, or I want to do a niche about garages, or I want to do a niche about golf or whatever your niche is that’s what you have to decide first, so who your people are. And then next you’re going to find out what they love. So if I’m a golf person I’m not actually a golf person. So maybe they like looking at golf courses, maybe they like looking at golf clothes, maybe they like looking at golf clubs. I don’t know, so I’m going to put six to nine different posts up and I’m going to boost them all to the same audience. So boost all the golf people and say, okay which one of these gets the most reaction out of you? Okay. Steve: So you are buying ads to – so how do you figure out what audience to try? Rachel: I try just the general one to begin. So if it’s golf, I will just try golf. Rachel: So golfing as an interest online. For my cats, when I just targeted cats and I found out by testing out the different types of content that the cats people related well to anthropomorphizing, is that the word? It’s when you make cat into a human. Rachel: So cat slumber party, cat acting like a toddler tearing up toilet paper, cat eating with a messy mouth. All of those things are making your cat to a human; those were the ads that really got the most engagement. So if I can sell a product by saying this makes your cat look like human, it will sell better. Steve: Interesting, so how much are you so spending to boost these posts initially? Rachel: Like two to three bucks. Steve: Two three bucks, okay so not a lot of money. Rachel: I don’t want Facebook to think I have money. Steve: Okay. And then how do you know whether it’s good or not? Like that are some of the metrics? Rachel: When people like that content then they like your page. Because my goal is not even to get that piece of content to go viral, my goal initially is just to build my audience. I don’t even want people to buy from me. All I want is to have them join my page and tell their friends about me. Rachel: Think of it like the MLM. We’ve all seen like those pyramid schemes, right? Only instead of making a pyramid scheme where you are selling something, make it a pyramid scheme of collecting people where if you tell one person who is the die-hard fan about cats or golf clubs about how awesome this your golfing situation is, then they’ll tell two people and those two people tell two people and those two people tell two people, and next thing you know you have a large thriving community that you can engage with. Steve: So in terms of like back to the ads, like you said you run a whole bunch of them, so do you just pick like the best one that generates the most like and then stick with that theme? Rachel: Yes, that one tells me what people like. So I’ll do six to nine posts and then I might three to four more versions to see which ones people real — I always want to find the one that beat my winner. So once I find the one that okay, this is real, I’ve narrowed down exactly what my people want to say. After that now I have already gone to the cats, now I want to find where inside the cat realm are people most passionate and active about cats or about golf. So maybe they are golf course owners. Maybe instead they are pro wannabes, pro golf wannabes, maybe they are the hobby guys who golf on the weekends. So you want to find where those people are who are going to become your most die-hard fans who are going to share your content for you. Rachel: So in the cat one, I targeted cats and that brought in likes when it was make your cat human, but what really brought in the die-hard fans was when I narrowed down and tried cat pages a little bit better, and then cat pages and cat products, well, that’s a little bit better. But I narrowed down to the people who can’t resist talking about cats are the people who work at no kill shelters. Steve: Interesting, wait, so how did you figure this out? Would you say you started changing the audience’s around for your [overlapping 00:19:26]? Rachel: Yeah. So once I found this one post converts to likes, now I want to make three more ads with that same post targeting different interests. Rachel: And see which interests then converts best, because once I know this type of post as well anthropomorphizing, and I know where those people are now I can make any post that’s about a cat as a human and target that audience and I know it will do well. Steve: I see. So how long do you boost the post for it in the beginning? Like how much data do you need to gather? Rachel: I try to just — I do two to three dollars each and I try to keep the same amount. So I’m going to do two dollars, I want to always do two dollars on my post, or three dollars, always do three dollars. It’s up to you as to which. I would not go higher than five dollars because you are wanting to stay a low budget because you want Facebook to think of you as an organic content source not as a money pot. Rachel: So I keep the dollar rate low, and then once — I like to send about 200 people to it because with 200 people I will know if there is a percentage of people that clicked through, if there is a percentage of people that buy. With 200 people I should be able to tell that information. Steve: Okay and so let’s say you picked, like in that first experiment let’s say you pick like six really bad ads, like how do you know that they are bad? Or do you just always run with the winner? Rachel: Whatever the best winner is, now that’s your winner, so beat that one. Steve: I see, okay so do you do multiple rounds at this beginning? Rachel: Oh yeah, oh yeah. Rachel: I may have done 15 rounds. Steve: I see okay, so how do you know when to stop doing the rounds? Rachel: When you’ve got — okay my last sales page I got it to convert at 34%. I don’t know if I can get a sales page to convert better than 34%, like that’s insane. So if you can get it to convert at 34% there is a point where you are like, that might be just as high as we can go, and now you can make another one so. Steve: I meant in terms of like the, I guess in terms of like the metrics. Like do you look at the click through rate, do you look at likes, shares? Rachel: Likes that then convert to your page as fans because what you want to do is whenever they like the content you ask them, hey, do you want to like my page? So there is an invite feature that you have if you have less than 100,000 fans. So you can say, hey do you want to like my page? And if the majority of the people who see that post like that post and then also go on to like your page, that’s a winner because that’s a person that’s already proven to click and to engage with your content. So they are already more likely to buy from you because they are already interacting with you. Steve: Okay so I just want the listeners to know these facts. So if someone likes one of your posts you can actually invite them to like your page, right? Rachel: Yeah, it’s so cool. Steve: Is that a manual process or is there a way for you to just say ask everybody who’s liked? Rachel: Unfortunately it’s manual right now. They did have an easier way but they took it away from us. Rachel: And it’s capped, so you get to do 500 a day. So what I suggest doing is like you, your spouse, your mother, you each get 500 a day to invite. Steve: And so it sounded like you made it up to like a 30 somewhat percentage conversation rate off of this and then that’s when you knew to stop. Rachel: Well, yeah I mean if you in your heart will know if you can top your win or not. Rachel: Duplicate, do it another time. So make another one, so you now have two that convert at 30% or four. Most of mine do not convert at 30%. Steve: Sure, yeah, yeah. I was just trying to get a general guideline, yeah. Rachel: I’m usually at the, a lot lower than that. Steve: Okay, okay, and then you mentioned earlier like with our cat page you finally found this one group that just was, it knocked it out of the park, right? Rachel: Yeah, that was the no kill shelter. For my crock pot page I found them in Mormon Women. So more Mormon Women because they I guess cook in bulk or they I don’t know, I tended to convert better from that. So it’s like, it’s funny how you find the people where they are going to convert the best but yeah. Steve: Is there like a method for you to pick your audience? Like with the crock pot thing I would not have not thought of trying Mormon Women, it just seems random. Rachel: It is random, it is. What I do is I interview my readers. Once I get a couple, I start realizing I’ve got a couple of die-hard fans, and it’s usually when you have about 500 readers, you have some die-hard fans on there. And so I interviewed my die-hard fans and I look for similarities in who they are and what they call themselves, and it turns out four out of five were Mormons. Rachel: So I was like, oh I guess Mormons like crock pots, and then I started targeting that and it was true, I converted much better. So I don’t know what it was, I’m not Mormon but I just find that I found that audience. I’ve used for one of my doctors who’s taken my course, he’s a pain practitioner, and we targeted cross fit and you don’t necessarily know who it is until you start interviewing your readers, and we found out that his die-hard fans were cross fit people. And so we were able to then target his anti-narcotics use program to people in cross fit and it did well. Steve: I just want to take a moment to tell you about a free resource that I offer on my website that you may not be aware of. If you’re interested in starting your own online store, I put together a comprehensive six day mini course on how to get started in ecommerce that you should all check out. It contains both a video and text based tutorials that go over the entire process of finding products to sell all the way to getting your first sales online. Now this course is free and can be obtained at mywifequitherjob.com/free. Just sign up right there on the front page via email and I’ll send you the course right away. Once again that’s mywifequitherjob.com/free, now back to the show. Interesting, how do you interview your fans, like do you just say, hey, can we get on the phone? Rachel: Yeah, I know it’s crazy. Some people say to give them a survey, but my thing with the survey is that you are asking them questions that you kind know the answers to or you are assuming an answer. When you are talking I would not have assumed my people were Mormons, or that they worked at no kill shelters. I’m not a cat person, I didn’t think of that out of my own. Rachel: I bet it was like this, whenever I saw it and it worked I was like, oh my word this is amazing because the cool thing too is when you find those die-hard fans, the ones those ads are the cheapest because Facebook, if somebody engages with you and they can’t help it. Every ad, everybody that likes it likes it; Facebook will give you likes for like 0001, I mean they are so cheap because every person that sees it converts, right? Rachel: So that’s funny [overlapping 00:26:36]. Rachel: I know it’s kind of crazy. I just would say, hey how are you doing, I am starting this page and I’m running it and I saw you interacted with me, and I was just wondering if I can talk to you about cats, and they did. Steve: I guess if they are diehard fans they probably want to talk about it, right? Rachel: I know it’s kind of funny they are. Six people I asked if I could talk to them and five said yes. And then with the Mormon one I think I had to go – oh it’s the crock pots that I think I asked like nine people and five said yes, and I think actually interviewed four. Steve: That’s actually a really high percentage, I’m surprised. Rachel: Well they are bored at home and they want to talk about cats, or they want to talk about cooking and their families. Steve: Okay, so you hit upon no kill shelters and you found ads that anthro- I don’t even know how to pronounce it, anthropomorphizes your cats, so what’s the next step after that? Rachel: So I found that making this about the cat is humans and this is the audience, well now all I have to do is do that a lot. Steve: Okay, so how do you find the content? Like you are not creating this content, are you? Rachel: Well, I was at the beginning and then once I was able to have some staff I started having my staff people, I always have my readers submit photos for me to use, and then I would have a staff person make them into memes and connect to Amazon products to sell. Steve: Okay, but that involves a little bit of creativity, right? Rachel: Yes, in the sense that I had to find somebody who is snarky, because I’m actually not very snarky. I’m kind of happy all the time, like what you see is what you get. I don’t like, there is no subtlety, there is none. Rachel: And sometimes like snarkiness needs to have a little bit if subtle finesse if that makes sense. So it wasn’t something that I’m good at. None of my memes do well, the ones that I make. So I found somebody who’s really gifted at snarky comments and smart out. Rachel: And she is really like really cheap. She makes a meme for a dollar a meme and I’m like, oh my worth, this is insane because for her it just takes seconds. She looks at the photos; she’s got snarky comments, the next photo snarky comment. And they’ve got meme creator software programs where you just type it in and move on to the next one. So she can do 30 images in an hour. Steve: Crazy, so she must be a cat lover then, right? Rachel: She is yeah; she is a snarky cat lover. So you do have to find somebody who is passionate in your niche. Steve: Okay, okay. So is it required that you produce your own content or can you just like share all the other people’s stuff? Rachel: Definitely not. Actually when you are starting your page I would suggest that you don’t share your own content primarily. Rachel: I would suggest starting sharing at least half somebody else’s content, if not a little bit more than half. The reason being is that you want Facebook to see you as the place where all the good content in that topic area goes. So if this is going viral on Facebook land in your niche, you want it to be on your page. So Facebook is like oh, all of the best cat stuff is here, all the best golf stuff is here, all the best fly fishing equipment, it’s all on this page. So you become the leader in your niche, kind of like the best library. Steve: Okay and so how do you go about finding all this viral content? Rachel: I know it’s kind of crazy; you just go to the Facebook search bar. Rachel: Yeah it’s that easy. You just type in fly fishing and then you get the top posts for fly fishing. Rachel: And I would say things like cats baby or silly cats. I would always add something with the word cats to make sure I narrow in on what my people are going to look for, but yeah, yeah you just type it into the search bar. And the most common stuff pops up. Facebook tell you this is doing well. Steve: And then do you share it or do you kind of like download the photo and post it as yourself, as your own? Rachel: When you are under 100,000 fans you want to share more from other sources than you download and upload. When you are over 100,000 you are going want to upload more than you share. Now you will always want to credit though because you are going to get into trouble if you download a photo and upload it to your page without citing. Steve: Okay, so citing is just saying like I got this from this and this site? Rachel: Tag the page and if possible add their URL, and even better is to get permission first but I don’t always have permission so I don’t always do that, but that’s the best case scenario. Legally you probably need to get person first. Steve: Okay, but to tag them usually they don’t get upset? Rachel: I have had like four-five people get upset with me about it, but I just don’t do it to them again. Steve: Okay, and so why is it important share after 100 — like where is the distinction of 100,000. Like what’s the magical thing that happens. Rachel: Under 100,000. Facebook loves when you get lots of likes and they reward you by you get to invite those likes to like your page. After you have 100,000 fans it kind of switches up a bit and you don’t get rewarded for having likes but by getting to invite them to follow your page. Rachel: And the algorithm emphasizes shares now for your page. Steve: Okay, and then when it comes to sharing stuff, like just because it’s popular that doesn’t necessarily mean it’s going to be popular with your audience, right? Rachel: Not necessarily but at the same time if it’s popular with cats and your cat page it’s probably going to be popular with your audience too. There is a high likelihood that Facebook is going to say oh, your cat page that’s cat content. We are going to show it to more people right now when you start your content out because we know that that post and your audience already fit together well. Steve: I see, I see. And so in terms of posting stuff on your own page, like if it’s a dud do you want to remove it or you just leave it there and move on? Rachel: I leave it there and move on because I don’t have time to mess with it, but I would love to have somebody test that. So if anybody in your audience wants to test removing and see. Steve: Yeah, I’m just curious. Rachel: I still might not do that out of practice but. Rachel: You got to pick where you got to spend your battle and your time, but I’d love to see if that works. Steve: So it’s important to always pick stuff that you think is going to go viral, right? Rachel: And actually one of the things that we talk about, one of the secret ninja tricks in the course is something called dark posting and viral funneling. So that’s where you post something as an ad as you test to see which version does the best, and then that’s the version you are going to post to your page. Steve: I see so let me just — you want to just to translate that for the listeners. So this is a post that’s not actually on your page, right? Rachel: It’s not there yet but you make it ad out of a post and you test. So that way let’s say you have three videos of your cat product and you don’t know which one you want to put all your ad dollars behind and you know that like next week you are launching, so you only have one week to figure it out. You don’t have three months to test and whatever. So what you could do is you could put three different versions up in the ad. Put five bucks on each of them, see which one does the best, and then start there. So it gives you a little bit of a heads up, a head start. Steve: Are you writing that ad against your own page or off of it? Rachel: Yeah, you run it on your own page in a dark post, so it looks like a post on your page but it’s only going out as an ad. Rachel: So it’s only people that you pay for. So it tests. It’s a way to test your audience and it’s something that Buzz Feed, Nifty a lot of the big pages do. Rachel: So you will never see anything on their page that hasn’t first been tested. Steve: I see, so do you do that with all of your pages as well? Rachel: Not unless it’s important. Rachel: So if it’s something that I’m going to convert from, I’ll do that. I’ll make that extra step, but if it’s just regular content I don’t that regularly, no. Steve: Okay. So you are sharing other people’s stuff, you are sharing your own clever memes, how do you enter posts like links to your own content and links to your own products, Amazon products and that sort of thing? Steve: What does your cat rolling pin ad look like or your post? I’m just curious. Rachel: Oh, know someone who loves a cat, know someone who thinks cats are great or awesome or know crazy cat ladies, and then the link, and here is where you can get it, your cookies will be amazing or something like that. Steve: Okay, you obviously can’t — or actually can you post like product links for every post as long as it’s corresponds with the meme or? Rachel: I mean you could do product links all the time. You just want to make sure that you are not like pushing your product on them. So if you are pushing at them it gets a little bit spammy if that makes sense. Rachel: So I would try to reserve ¼ of my posts to be a little bit more where I want to direct traffic to. So I don’t consider the memes to be traffic directing as much because I’m not saying go click here to buy this for 20% off. It’s more of building my audience, and if I happen to make sales at the same times, that’s amazing. Steve: So there is no real call to action here. You are really guiding them to the content and then kind of indirectly as some people click then that’s great. Rachel: Yeah and so like know someone who is like a crazy cat lady, what my call to action is, is to tag your friend who loves cats. Steve: Interesting, okay so nothing about go buy here or anything like that or sale. Rachel: No, no, so it looks like hey, I have a crazy cat friend, I’m going to let them know about this cat product too. So they are telling their friends about the cat product, I don’t have to. Steve: What is a good percentage in terms of shares and likes when you post something of the people that view it? Rachel: It depends on the type of product and the size of your page. So as you get bigger, you are going to have a slightly lower reach as you grow and grow and grow. Rachel: So per capita. So as you are beginning you get kind of like a oomph, a little bit of extra power behind your shares. So the sweet spot is like 50k to a 100k you have a lot of reach per capita. So yeah, it varies per page. Steve: So what is like considered a good reach? Because I know Facebook keeps nurfing that, right? And so what percentage would you consider a good reach off of the number? Rachel: I like to have each of my posts reach roughly 20% of my audience that then probably half of them reach it right now. So probably only half reach that target right now. Steve: Okay, I mean that sounds really high compared to like what I’ve talked with other people, but perhaps they are not sharing viral stuff which is why it’s much lower. Rachel: Yeah, and most of my content reaches, I’d probably say about half of my content reaches 20% of my audience so. Steve: Okay, that’s really high and so that’s probably because you take the extra effort to only find stuff to share that you know it’s going to be popular. Rachel: Yeah, I only want — I don’t want to cannibalize my page. So my audience is my primary goal and if I can keep them happy on my page, then they will keep buying from me. So if I can build that audience of people who love a topic and cultivate them, yeah. Steve: So let’s switch gears a little bit, let’s say you already have a fun page and a lot of people already do, and let’s say the engagement is like really, really bad, do you recommend just starting from scratch or can you revive something that’s dead? Rachel: We do have students who have been able to revive. We’ve had a couple of students who revived in massive ways. We’ve had one student who her page was at 25k for like years and she hadn’t grown with like a couple of thousands in like a year or two. Does that make sense? Like she’s just been 25k forever. And so she grew her page to 265,000 by today and it’s been on like four or five months. So she went from 25,000 fans to 260,000 fans. So it’s totally, totally possible but she had to do it by focusing only on her audience. So how do I make them really, really thrilled to receive this content? Steve: Okay, because I was thinking and we kind of had this conversation at the summit where I have a page where I have just been kind of posting my blog posts and lot of them get no engagement. And I remember you telling me to just stop that and then — actually you recommended I start over from scratch. I can’t remember what the distinction was. Rachel: So it depends how much of the page is branded as you and how much you can brand as your reader. And you can still be branded as you and feature your reader. You just need to find a way to feature your reader more. So you can revive a dead page, but sometimes it’s easier depending on your size to just start over. Rachel: Another thing you can do is that trick is to go in and check your audience. So you can go in your page settings of your page and then go to people in rows — people in pages I think. People in pages and you can see who actually is liking your page. So you can go down there and see, okay are they cat people. For me I can see this person has cats or this person does not have cats, or I can see, okay wait a second I have got a lot of guys, I’m a mom mom’s page for DYI mom stuff and there is a lot of guys with all international sounding names. So they are probably not my audience. So I can see where I’ve been off on my targeting. Steve: Okay, and do you recommend like let’s say you have a company. Do you recommend doing a company page or just some complete third party page that is unrelated to your brand? Rachel: It’s best in my mind if you don’t look like a company because Facebook wants brands to pay. Facebook is a business, they are out to make money, but they also have a need to make people happy reading their content, have people engage in content. Rachel: So if you look like a content provider, i.e. the person who’s just really passionate about trains and just wants the world to see this new train engine that does X, Y, Z and all the other train people that love trains like to talk about it there. If they see you as that passionate train person, they are going to give you more juice to that train audience than you would if you were a train company selling a product. Steve: I see, so if you already have like a company page that’s kind of dead, then you may as well just leave it as your company page and then start. Rachel: Use it as a resume. Rachel: So like with my pages I have Muller marketer and it’s not a page that’s going to go viral, it’s a resume. So you can go there and you can see here is who Rachel is, here is what Rachel believes in, here is Rachel’s products, here is people who love Rachel. It’s a resume. But it’s a good and you can convert from it, but it’s not going to be a traffic driver, does that make sense? Steve: Yeah, that totally makes sense. And what about the distinction between groups versus pages? Rachel: Oh, groups are so much fun because you can motivate people to love you in a different way, connect with you. The problem with the group for selling say Amazon products is that you give a lot of your control away when you bring people on in a buy in like they do in a community because everyone now gets a chance to talk. So they might complain about your product, they might complain about you, they might complain — so for physical product sales, groups are harder to win at unless you are going to do like Facebook lives regularly, kind of like an infomercial system insider group. Steve: I see but on a page they can still comment and there could be backlash still, right? Rachel: But it’s easier to hide that backlash. Steve: I see, I see. Rachel: Whereas as in group you don’t have as much control over the backlash. Steve: Okay so for ecommerce you still recommend going the page route? Rachel: Yes because you can’t run ads from your group, you can only run ads from a page. Steve: Okay, got it, got it. Rachel: So now what I would suggest too maybe have a VIP group where they talk about discounts, or they give reviews to each other. Like you team up with six other Amazon people and you make a review group, and so all of your customers go here and then they can get early access to new products at a discount, and as long as they give reviews to each other’s group. So it’s like a corroborative review. I don’t know if that’s even legal or anything but that could be a system where you have a group that’s still meeting your needs. Steve: Okay, okay and in terms of like the timeline, like when would you start actually start to link to products? Do you recommend having a certain number of fans before you start doing any of that stuff? Rachel: I link to products right from the beginning. Steve: Oh you do? Okay. Rachel: Yeah, because I want to test to see what they buy, but my goal isn’t to get them to buy the product, my goal is to build my audience. So even if I’m putting that product up, if it’s going to take away from building the audience, then I’m not going to put the product up. So it’s not about me getting sales, it’s about me collecting those people. Steve: I see so it sounds like the sales are just kind of gravy for you. Rachel: Yeah, once you get the people the sales kind of happen automatically and you don’t even have to work for them. Like it’s not — I mean you don’t, it’s not that you don’t have to work for them, you still have to put the product up, you have to think about it, you have to find new products, so it’s not — but the effort of trying to convince someone to sell and to purchase is a lot easier when they’ve already told you what they want to buy. Steve: Right, right, and in terms of what you are sharing, do you find yourself sharing more videos these days or photos? Rachel: Videos, yes. Videos, videos, videos, but the thing is too you can kind of make those video photo things where you take a screen shot on your page. They’ve got like Camtasia has a screen sharing system and you can take a photo, put it on your page, make the Camtasia over that and then just run it for five minutes. Steve: Oh, and that works too, interesting. Rachel: So it looks like a video but it’s not a video. It’s kind of sneaky and I don’t like seeing them as a user but they do convert. Steve: I see and that might just be temporary but yeah, for now that’s probably working well. Rachel: It is, I can’t see it lasting though but yes, right now video is but you don’t have to, it doesn’t have to supper fancy. A lot of times authentic sells better than fancy and perfect. Steve: Okay, so you are actually recommending like less polished videos for example. Like iPhones videos. Rachel: Something that your readers can say that’s me. So if the readers can see something polished and say, oh, that could be me then that works. So like purple has an egg, the egg falling on the mattress, it’s very well-polished, it’s very well screened but at the same time you are like oh, I could slip up. You can picture yourself putting an egg on your mattress and trying that. So you want to have something where the person can picture themselves in that scenario. Most of the time people can picture themselves with a cell phone and they feel like it’s a real product review versus somebody just talking trying to sell them something. Steve: Interesting, okay yeah so all these principles it sounds like will translate directly over to running Facebook ads for your products. Like instead of saying, hey we have a sale, put – run a Facebook ad for just some meme and just link to your product and just see where it goes. Rachel: The word sale actually will hurt your reach because sale assumes you are a business and Facebook wants businesses to pay. So instead of using the words sale, say this is rock bottom guys. Steve: So you are saying these trigger words actually reduce your reach. Rachel: Yeah, we have a whole list of the banned words somewhere in the course too. Rachel: And like words from a place like go get this now or it’s a buy one get one. Could you believe what I got to leave the shopping cart with double or something like that? So you can- I get to leave with double or something. That way you are saying I got two without saying buy one get one. Steve: Okay. So it sounds like you can get by sharing other people’s stuff for the first 100,000 and then once you pass 100,000 fans you got to start kind of inter-mixing your own stuff in there. Rachel: Yeah, I would suggest starting, making sure that you’re starting to focus on shares after 50,000 for sure. Rachel: Before that is good too but after 50 for sure, but by 100,000 if you are not, your page is going to have a hard time growing, and you are just going to be stagnating. Steve: Okay, I’m sure a lot of the listeners will be happy just to have 100,000 fans. Rachel: The cool thing about 100,000 is you can just coast at 100,000 too for a long time and drive traffic decently. So it’s not, it’s like my Crazy Cat Lady page now. I’m not really working on growing it as much because it’s at 100,000, it’s driving traffic. It’s a lot faster for me to share somebody’s stuff than it is for me to create new and so I’m just kind of coast at 100 and keep making money of what I am. So there is nothing wrong with once you get to that stage duplicating it and saying okay, I’ve got one, I’m making money, I’m selling, now let’s get the second page going before we want to scale those to kingdom come. Steve: What about in terms of content like blog posts. Is it fine just to post the link to your blog post like when you are not trying to sell something? Steve: With a link in the content or notes? Rachel: In the description, you can put in the description or in the content, either one, comments. Rachel: So I try doing both really if you have time. I schedule everything ahead of time so I don’t always remember to go back and put something into the comments, but yes, you can put into the description and into the comments. Steve: Interesting, because it works better when you put in the comments. Rachel: It does but that requires you to then baby sit it. Rachel: And from my opinion the value of the, it works better versus my time of now having to go online four to five times a day at a certain time to post, I’d rather one more time a week and get the whole week done. Steve: Okay, well this has been really great information Rachel, and believe it or not like this 40 minutes that we’ve been talking like just blew by really quickly. Rachel: Oh, it’s been 40 minutes already, wow? Steve: Yeah, it has crazy, right? Steve: But Rachel where can people find more about your teachings? I know they work and you’ve had amazing results, where can people find you online? Rachel: Yeah, it will be easier for people to click through on that link and you will always find me. Steve: Yeah, for user, for sure, let’s do that. Rachel thanks a lot for coming on the show. I feel like we covered a lot in just 40 minutes, maybe it’s because you talk fast and you are always full of energy. Rachel: I do I talk way too fast. I know it goes really fast. I love collecting people and this is really fun topic for me. So thank you. Steve: And one thing I really like about Rachel too is like a lot of the money that she makes goes to charity also, so I mean yeah. Rachel: I know we can build the whole school, I’m really excited. Steve: Yes exactly, do you want to talk about that real quick? What you are doing with that. Rachel: Oh, do you mind? Steve: Yeah, go for it. Rachel: I’m like beyond over the moon over it. Yeah, we found — we are going to be building an entire school for 300 to 400 students in Kenya in internally displaced person’s camps. That’s where people who were moved out of their communities by force due to segregation now get to have like a brand new school and hopefully in the future we’ll get to put in wells and electricity. I want to make impact on more than just me and even more than just those people whose businesses aren’t healthy. This is the chance to kind of make a difference on the world and I’m excited by it, so yeah. Steve: Yeah, so I mean if you support Rachel you are supporting Kenya as well. Steve: Thanks a lot for coming on the show Rachel, really appreciate your time. Rachel: You have a great day. Steve: You too, take care. Hope you enjoyed that episode. Rachel is awesome at creating viral Facebook fan pages and I’m actually taking her class right now and I highly recommend it. So if you are interested in learning more about Rachel’s teachings, head on over to mywifequteherjob.com/Rachel. And that’s R-A-C-H-E-L. Now for more information about this episode go to mywifequitherjob/episode175. And once again I want to thank Seller Labs. Their tool Scope has completely changed the way I choose keywords for both my Amazon listings and my Amazon advertising campaigns. And instead of making random guesses, Scope tells me exactly which keywords are generating sales, and within the first week of use I saw a 39% increase in sales. It is a no brainer. So head on over to Sellerlabs.com/wife and try the tool for free, and if you like it you will receive $50 off. Once again that’s sellerlabs.com/wife. I also want to thank Klaviyo which is my email marketing platform of choice for ecommerce merchants. You can easily put together automated flows like an abandoned cart sequence, a post purchase flow, a win back campaign, basically all these sequences that will make you money on auto pilot. So head on over to mywifequitherjob.com/K-L-A-V-I-Y-O, once again that’s mywifequitherjob.com/ K-L-A-V-I-Y-O. Now I talk about how I use these tools on my blogs and if you’re interested in starting your own ecommerce store, head on over to mywifequitherjob.com and sign up for my free six day mini course. Just type in your email and I’ll send you the course right away, thanks for listening. Outro: Thanks for listening to the My Wife Quit Her Job Podcast, where we are giving the courage people need to start their own online business. For more information visit Steve’s blog at www.mywifequitherjob.com. If you enjoyed listening to this podcast, then please support me with an iTunes review. It's easy and takes 1 minute! Just click here to head to iTunes and leave an honest rating and review of the podcast. Every review helps! Ready To Get Serious About Starting An Online Business? If you are really considering starting your own online business, then you have to check out my free mini course on How To Create A Niche Online Store In 5 Easy Steps. In this 6 day mini course, I reveal the steps that my wife and I took to earn 100 thousand dollars in the span of just a year. Best of all, it's absolutely free! Steve, you’re taking (or took) Rachel’s course, right? What have you taken away from it? I’m thinking about taking it. Thanks! Create A Profitable Online Store! A completely FREE mini course on how to develop a niche ecommerce website in 5 easy steps! Learn how to find products to sell and setup your online store. Get the free course now! How Long Does It Take To Start An Online Business? BigCommerce Vs Shopify – Which Cart Is Cheaper And Better? How To Start A WordPress Blog On A Shopify Or BigCommerce Store And Should It Be On A Subdomain? Every Self Made Millionaire Has This Mindset…Do You? MyWifeQuitHerJob.com Copyright 2019 All Rights Reserved.